So I decided to hit up Veganomicon for some new recipes last night. First, I found the Tamarind Lentil recipe. Then I turned a couple of pages and found the Curry Tofu recipe that suggested I serve both together with some basmati rice. Somehow I ended up in the back of the book and found some meal plans, one of which was for an entire Indian meal with the addition of Cornmeal-Masala Brussel Sprouts. I’d never made basmati rice before, but it turns out brown basmati rice cooks the same as brown rice. Directions:Put both into a pan and raise to a boil. Let it boil for a couple of minutes, drop to low, cover and simmer for 45 minutes. Check to see if water remains, and if so check in 5 minute increments. Fluff with a fork before serving. 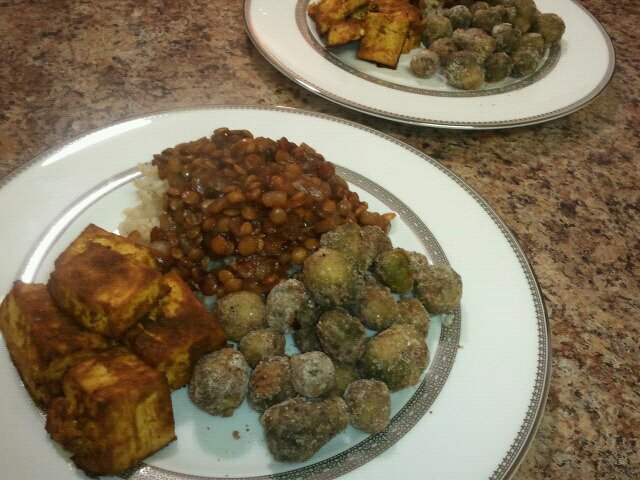 The Tamarind Lentils were easy to prepare and absolutely AWESOME. They brought all the dishes together, and the brussel sprouts were good slathered in some of their sauce. I will definitely be making these over and over again. This dish had so much yummy flavor. I tried to buy fresh brussel sprouts at WF and the only ones they had were HUGE, so I was just going to skip it, but then I found a bag frozen petite ones, and figured, why not?! That being said, my results of the Cornmeal-Masala Brussel Sprouts were probably not typical, especially since I further strayed from the recipe by using a mix of yellow & blue cornmeal & cutting the fat down to a few sprays of olive oil instead of 8 tablespoons of oil. For being a vegetable I grew up hating, they turned out pretty well. They were toasty on the outside and kind of mushy on the inside (which I totally realize is from being frozen) but they mixed in with the rice and lentils very well. The Curry Tofu was super easy to make and so well seasoned. 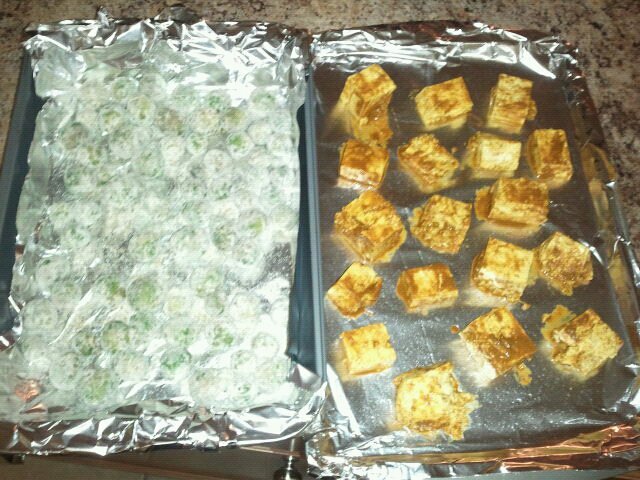 I cut the tofu into cubes so I could quick press it, and get it going. The best part was that the tofu & sprouts could cook together, because the oven temp (400*F) and timing (25-30 mins) was the same for both! We killed all this delicious tofu in this 1st meal, which was kind of a bummer, because it was so good. We both got to eat leftovers of lentils, rice and sprouts on day 2. The sprouts reheated really well in the toaster oven on the convection setting at 400*F for 5-7 minutes. I just made tamarind lentils and it is soooo amazingly incredibly tasty! I didn’t have tamarind paste, so used Worcestershire sauce. So easy to make! I’ve made the curried tofu many times before and love it totally. These are only a few recipes from Veganomicon that I’ve tried because this book is quite intimidating to me. Thanks for reminding me about these recipes! The worcestershire sub is a good idea (since I’m currently out). I love the Veganomicon, but if you want simpler with similar results, try Isa Does It!